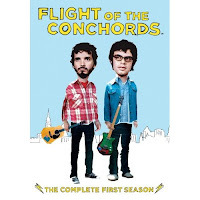 This show has received enough press in various indie media venues that I'm assuming you guys have heard of it or watched it or whatever, but if not, I want to draw your attention to Flight of the Conchords. This review at the Onion A.V. Club sums it up pretty well (and I'm feeling a little lazy for a full review this afternoon). I haven't watched every episode, but I've watched enough at this point to say that it's brilliant. The fact that the songs--which are awesome--are incorporated into each show less than seamlessly is half the fun. All in all, I haven't been this enthusiastic about a comedy since the British version of The Office, which is the highest praise a show can receive from me. I highly encourage you to check it out if you haven't done so already. This afternoon, I was bored of packing, working, and sitting around mostly full boxes. So, I went to the movie theater. I hate going to the movies, but boredom forced my hand. I set out to see Beowulf, but instead ended up in The Mist. It wasn't great, but just pretty good. The acting and directing was great (especially Marcia Gay Harden's spot-on performance as the religious freak). The plot was nothing you haven't seen before: people trapped in chaos--NOTLD, The Thing, etc. It was scary enough and compelling enough to keep me on edge and interested. The CGI was brilliant and totally seamless, in the end providing some surrealist, almost wonder-inspiring moments of Lovecraftian terror. And Darabont just barely pulled off the ending. 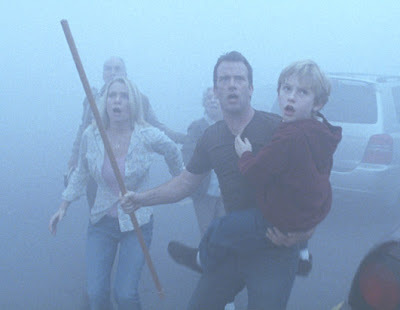 The best part: Darabont cranked up the anti-religious aspect of the story to 11. And then some. Even in a mostly empty theater in Alabama, people cheered, really cheered, against Harden's unhinged, vainglorious Christer character who wanted human sacrifices over solutions. The idea that a religious fanatic can eventually control a majority of a given population under stress rang true, and it became the focal point of the plot. The movie was depressing, as almost all films of this sort are, so don't go in expecting to walk out feeling better. And there were some cliched characters and moments, not to mention several rather obvious plot holes. However, it was certainly one of the better Stephen King movies and would be worth a DVD rental in a few months. I used part of my relocation budget to buy a Serius satelite radio thing. I LOVE it. Punk, alternative rock, Martha Stewart, Howard Stern, an entire gay channel, NPR, raunchy comedy, and the BBC...will I ever be bored in my car anymore? I doubt it. Today I had to choose between Frank DeCapo, Sublime, and The Bouncing Souls. All hail our space-based entertainers! In honor of tomorrow's holiday, I encourage all of you to peruse the Wikipedia article on turducken if you have not already done so. Truly, the noble turducken is food as art, or vice versa. I was particularly astounded by the "variations" section. What I wouldn't give for a slice o' that lovely bustergophechiduckneaealcockidgeoverwingailusharkolanbler. It sounds much more appealing than turdbutt, anyway. Happy Thanksgiving, ya'll. So I've resisted doing a post about The Perry Bible Fellowship because up until recently, it was only an interweb thing. 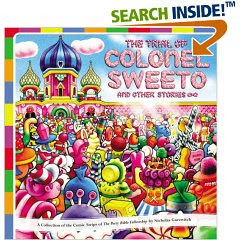 But now Nicholas Gurewitch has come out with a book of his comics, called The Trial of Colonel Sweeto. I guess I'm sneaking this one in through a loophole. Simply put, this guy makes the funniest/sickest/prettiest comic strips I've ever seen. Some of you might have seen them, too, 'cuz I was sending them out to people in e-mails for a little while. Some of the drawings are so crudely drawn they make Gary Larson look like...umm...someone who draws really well. Some of them are works of art you want to blow up and put on your wall. The complexity of some of the jokes is amazing and it may take you a second to understand a few of them, but it's worth it. Here's the first PBF strip I ever saw, and I was hooked from then on: So check it out, either online or in book form, if you get the chance. Good stuff. 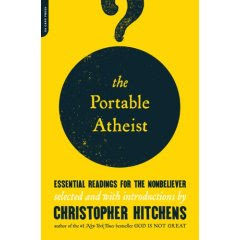 The Portable Atheist is a must read, and I'm only through the first 50 pages. And I bought it today. Religion invents a problem where none exists by describing the wicked as also made in the image of god and the sexually nonconformist as existing in a state of incurable mortal sin that can incidentally cause floods and earthquakes. I had the great pleasure of going to an MC Chris concert tonight at the Zydeco. Unlike the first time I saw him, this time the crowd was all geeks who totally got it. The show was a lot of fun; go see him live if you can. I haven't witnessed that much geek solidarity (and geek talent) since my first TMBG show back in the early 90s. It must be beheld to be believed. Buy his CDs if you want to stay cool. And give it up for the Tussin! 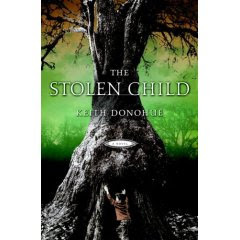 I don't have much time to expound on The Stolen Child, but I will say that I really liked it. I don't think adult fairy tales are a particularly easy genre to pull off, but Keith Donohue pulls it off with aplomb. The story follows the lives of a little boy who is kidnapped by a tribe of hobgoblins (or changelings) and the changeling who takes over his life. It's unique for many reasons, not the least being that it takes place firmly in the US (as opposed to England) and during relatively modern times. It's a fast, entertaining, and at times thought- provoking read, and I would encourage anyone to give it a try. There's not a lot of magic being tossed around here willy-nilly, so even readers who aren't big fantasy fans would probably find something to enjoy here. "Centauri: [voice in video game] Greetings, Starfighter. You have been recruited by the Star League to defend the frontier against Xur and the Ko-Dan armada. " This movie rocked my world when I was a wee little lad. I came across this today and had to post a link to the other blog that discusses it. 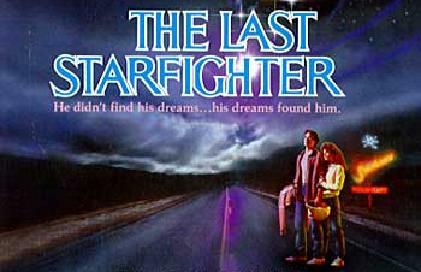 You see, Atari never released The Last Starfighter video game until now, for free, here. Damn, that would fit nicely in my dude room. I'll have to add the movie to my queue now. Polish up on my lines. The cinematography was the best I'd seen in any Anderson film. It's hard to watch this movie and not want to travel to India yourself. Instead of the sprawling casts of borderline cartoonish characters that populated The Royal Tenenbaums and Life Aquatic, the plot just follows three brothers on their journey through India. Not that all the characters in the other movies weren't fun, but by focusing on just three characters and getting to know them better, the movie is much more streamlined and subsequently, more coherent. The dialog is, as usual, almost poetic at times, though I'd have to watch it again to take it all in. Favorite line: "I love the way this country smells. I'll never forget it. It's kind of spicy." Though I feel kind of guilty criticizing the guy who just tried to off himself, I'm kid of tired of Owen Wilson. None of the characters he plays are all that different from one movie to the next. At least Adrien Brody kind of made up for that. Anderson used the slo-mo move one two many times in this film. It's cool once in a while, but eventually I started to notice it too much--"Oh, they're running in slow motion again. Woopty-doo." This was the first Anderson movie not scored by Mark Mothersbaugh, but I can live with that considering the film's locale. The music was wholly appropriate, as usual, and I have the soundtrack already (though I haven't listened to it yet). I can't say where I'd rank this among other Wes Anderson movies yet--though it's neither the best nor the worst. In a lot of ways, it's a departure from his previous films, and I think he was due for something a little different. I'll dutifully by the Criterion DVD when it comes out. I have no choice but to post this story about a new Whedon TV show in the works. Yes, it's for Fox, so it probably won't last long. But one can dream, can't one?